As a general rule yes. Should that not prove possible the final assembly will take place by trained USM Haller technicians on-site. For more information please contact the (smow) USM Haller service team. 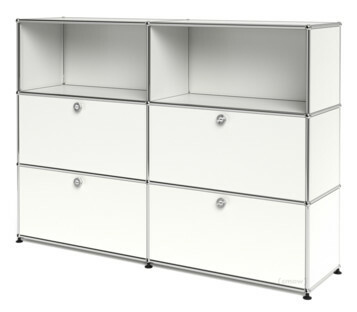 Can I add doors and drawers to an existing USM Haller highboard? 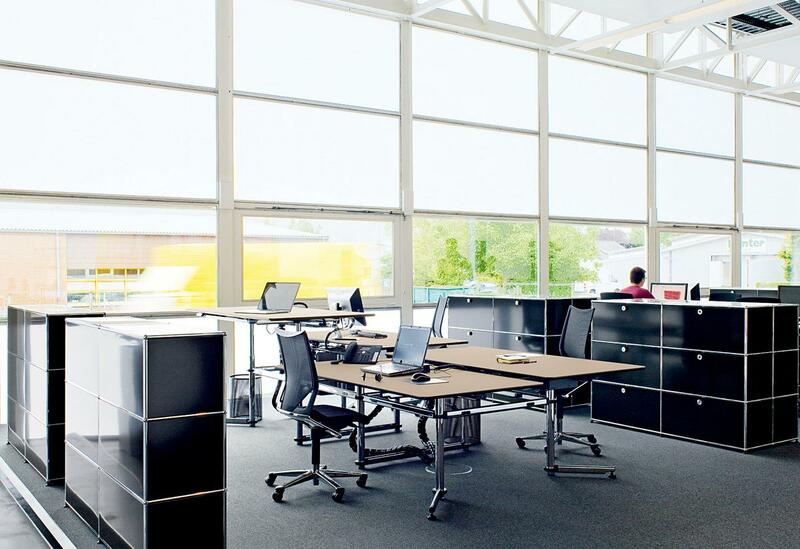 As a modular furniture system USM Haller is designed to allow changes to be made. The addition of drop-down doors is relatively straight forward and can be undertaken by anyone with a minimum of technical competence. The extension doors require a little more skill and as such should only be fitted by trained USM Haller technicians. 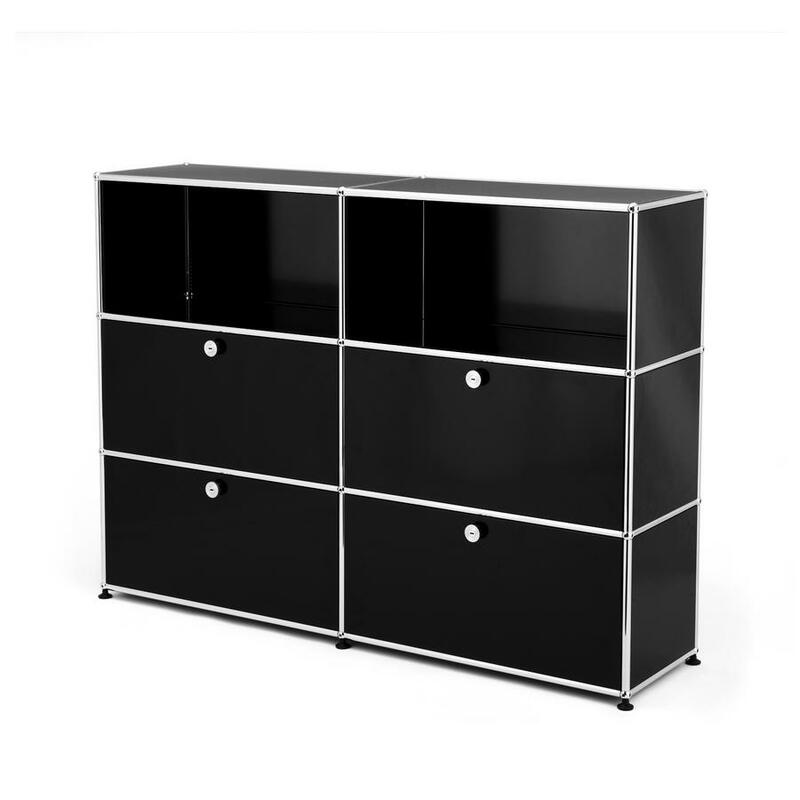 Can I order the highboard with an alternative number of doors? In 1961 the Swiss architect Fritz Haller designed new production and administrative buildings for the Münsingen based company USM. 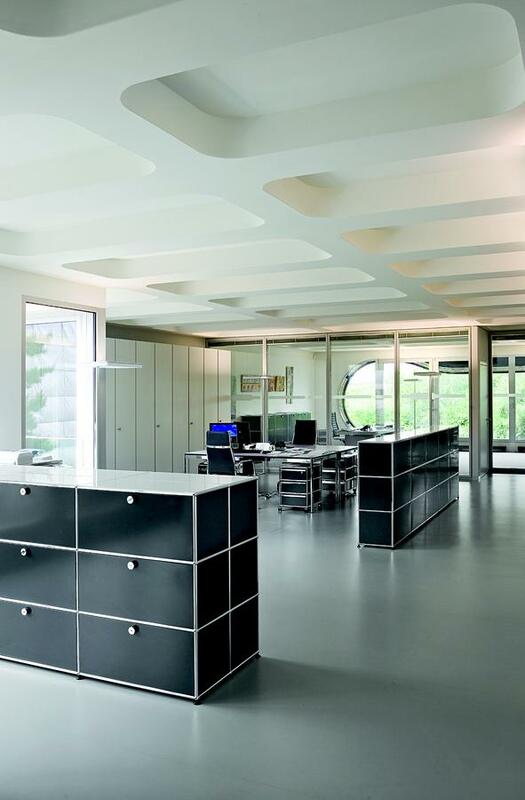 As part of the commission Haller also created furniture for the offices: and thus was System USM Haller born. In 1969 the Rothschild Bank selected USM Haller for their Paris HQ - the first external order for USM Haller and the start of mass production of the system. 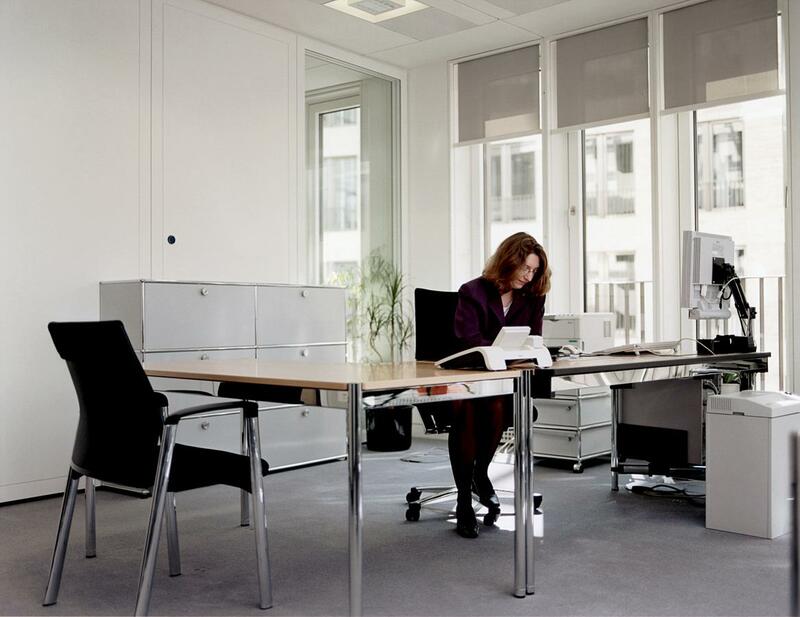 In the following decades System USM Haller with its flexible construction principle helped define the concept of open plan offices, allowing users to create rooms with rooms and underscoring the principle that furniture isn't a fixed object in but an active component of a space. 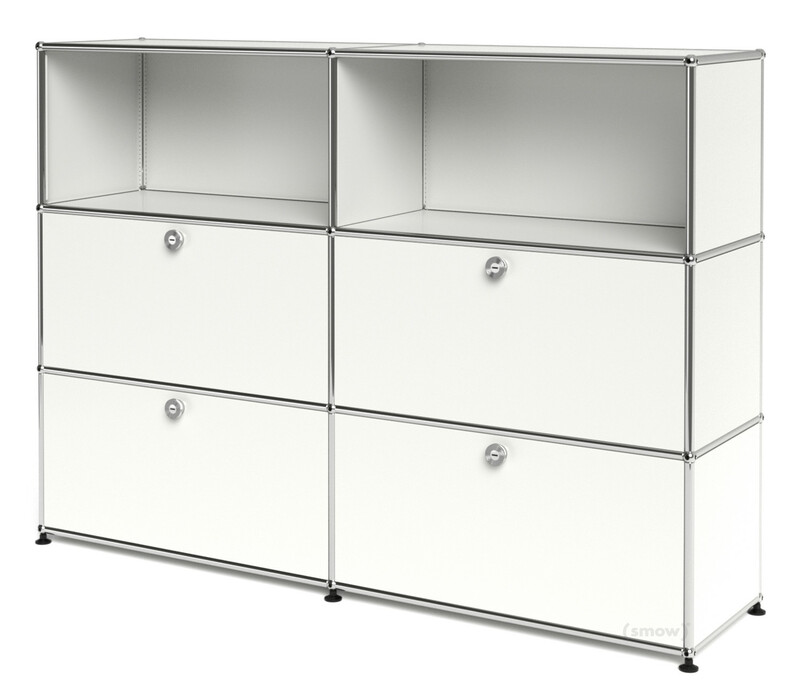 The USM Haller Highboard L with 4 drop-down doors has six compartments, two of which are open, and with a depth of 35 cm is perfect for storing files and folders. 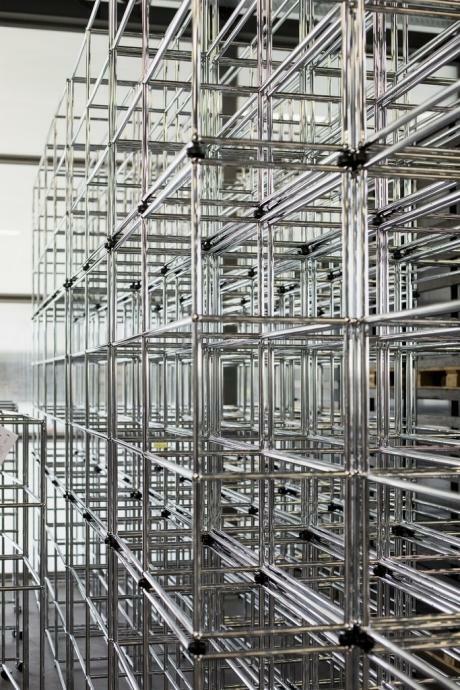 All System USM Haller components are produced at the company's base in Münsingen, Switzerland. Orders for Germany are the assembled at the company's facility in Bühl, Baden-Württemberg. 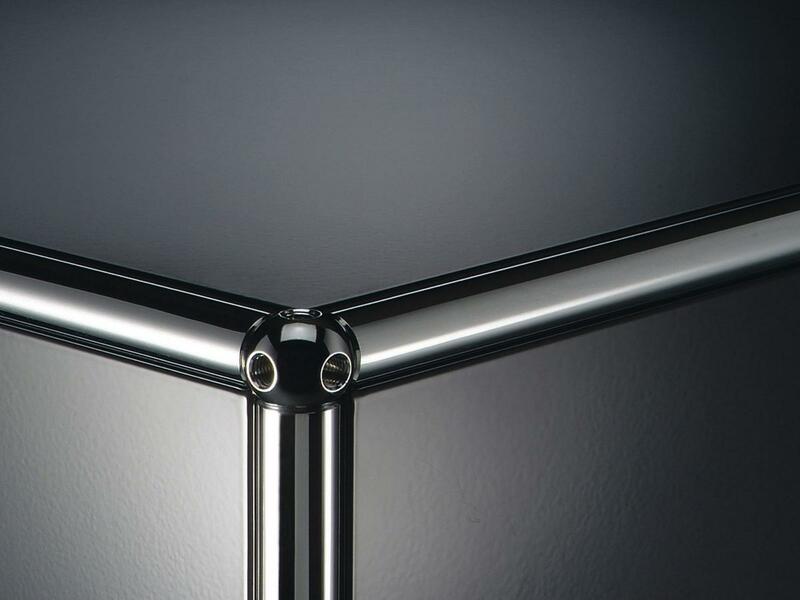 As with all USM Haller units the USM Haller highboard is constructed from a chrome plated steel tube skeleton held together by chrome plated brass connector balls. Metal and glass panels in a wide variety of colours then complete the structure. 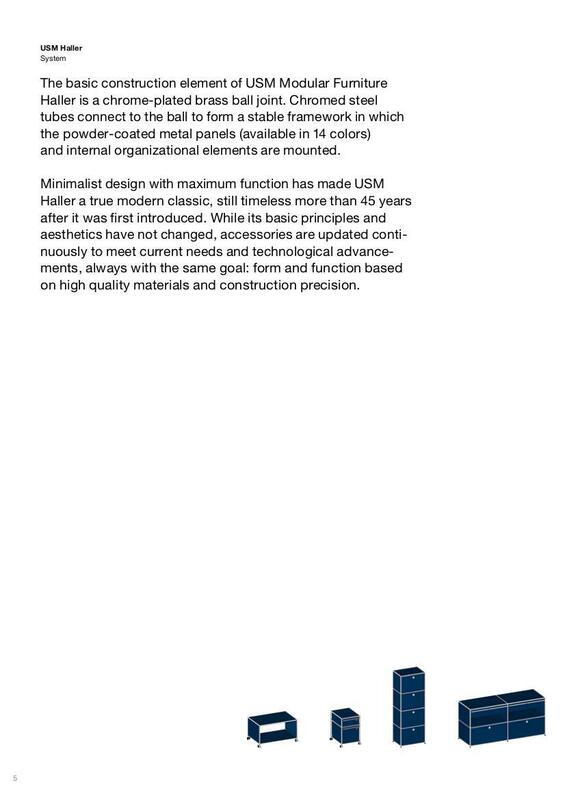 In addition to defining the systems aesthetic charm the construction principle also means that when properly used USM Haller units need never be replaced and can be extended as required. 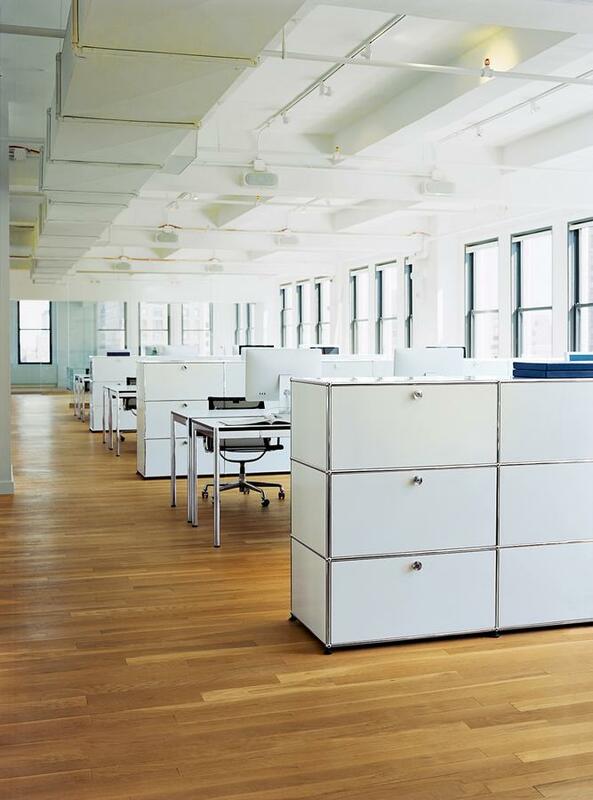 Thus making USM Haller one of the most sustainable furniture systems on the market. 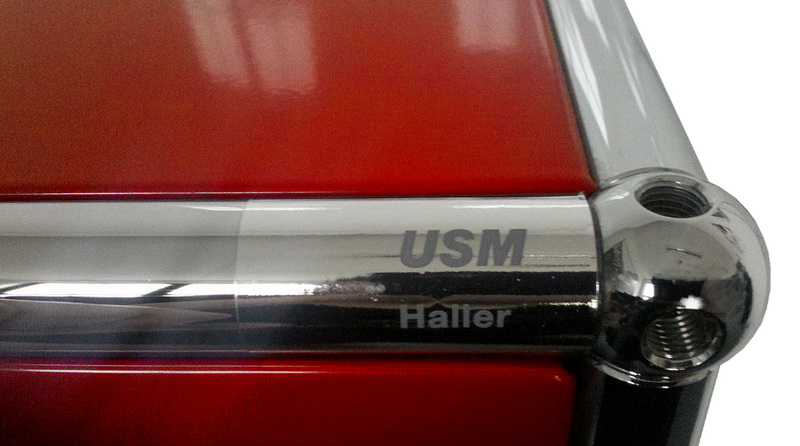 The story of USM Haller begins long before the creation of System USM Haller. Established in 1885 in Münsingen near Bern as a locksmith and ironmongery business the company grew steadily over the decades. Following the addition of window and door production a decisive moment cam when the Fritz Haller was commissioned to plan new production and office facilities in Münsingen. And almost as a by-product created the USM Haller storage system. 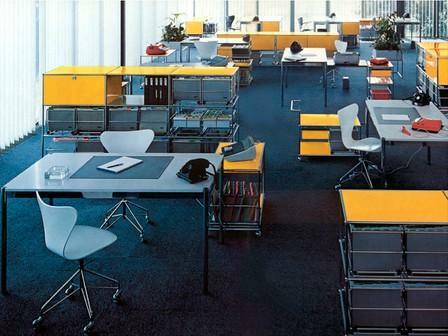 Mass produced since 1969 System USM Haller has, thanks largely due to its flexibility and durabiliyt, established istelf as a genuine, and much loved, furniture design classic. Born in Solothurn, Switzerland in 1924 Fritz Haller developed a wide and varied range of buildings including schools, factories and offices. 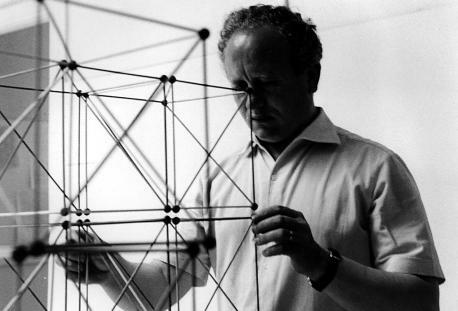 The co-operation with USM began in 1961 when company boss Paul Schärer commissioned two new buildings for the company. A commission from which System USM Haller arose. 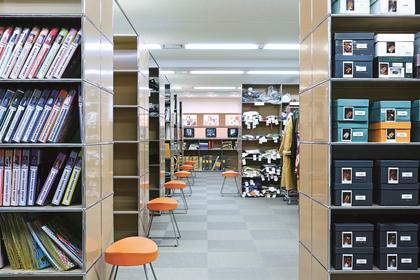 A furniture system which has been recognised with numerous awards and which has been added to the permanent collection of all leading design museums. In addition to practising as an architect Fritz Haller also taught at the Universities in Karlsruhe and Stuttgart. Fritz Haller died in Solothurn, Switzerland in 2012. Created in the atmosphere of post Second World War economic expansion, System USM Haller is a perfect example of design driven by function. 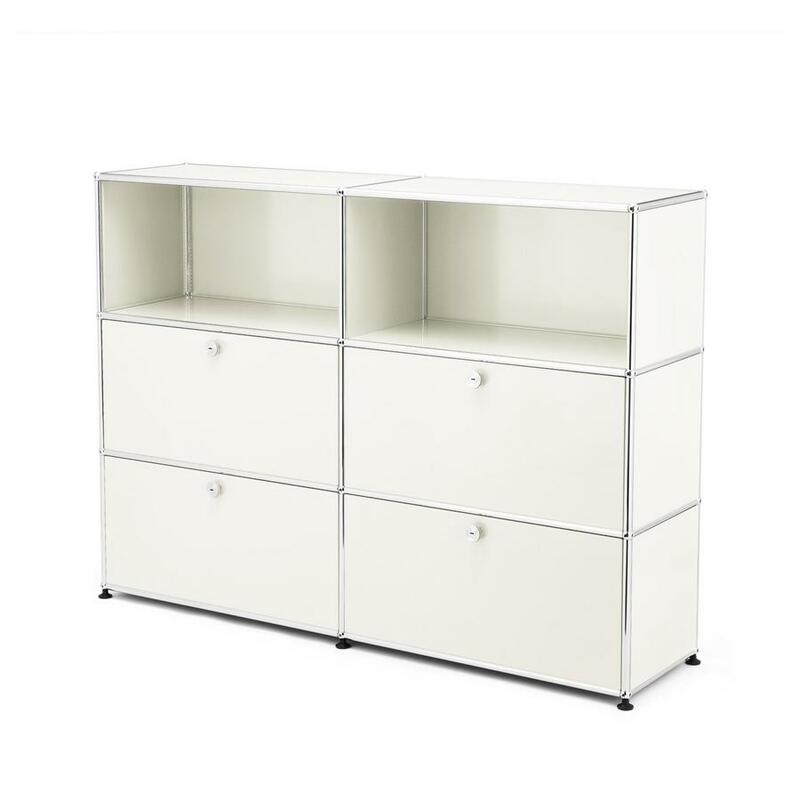 Thanks to its simple construction principle System USM Haller allows an enviable number of combination possibilities and thus makes the system not just a genuine design classic but a furniture system that is actually useful! 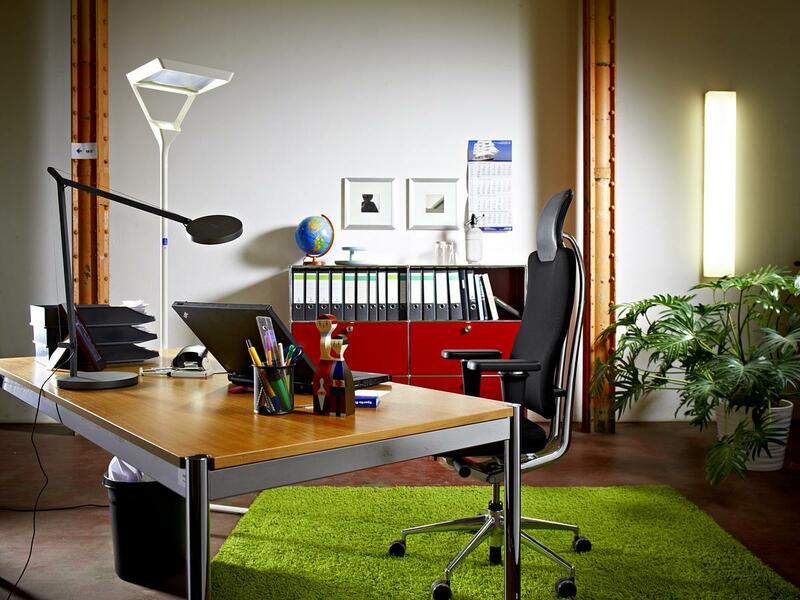 USM allows creative and functional solutions for all situations.